Attention, fellas. Sonam Kapoor is on the red carpet. For her second red carpet appearance in Cannes, Sonam Kapoor opted for a beige gown, hand-picked for the studios of US-based designer Vera Wang. As Sonam walked along the carpeted alley at the Cannes Film Festival, the long train of her dress - hued in beige and yellow - followed around gracefully. Sonam rounded off her look with a messy bun and make-up comprising dramatic eyes, which reflect the colours of her dress. L'Oreal, the cosmetics brand which is hosting Sonam in Cannes, summed up her look in fewer words and said: "All stunning sunset hues in one look." Sonam added just the right amount of sparkle to her look with a pair of Chopard earrings. We’re crushing over this dreamy look. @sonamakapoor stuns in Infallible Pro Matte Liquid lip - Rebel Rose, Infallible Blush Paint- 01 Pinkability, La Palette Gold Eyeshadow & Superstar mascara. The L'Oreal ambassador made several appearances throughout the day. In the afternoon, Sonam Kapoor navigated the French Riviera in a white and red striped dress from the shelves of Emilia Wickstead. Pretty simple but so smart that we want to get out hands on the outfit soonest. For the first time she stepped out, Sonam opted for the denim pants and white shirt combination. She clubbed designer brands like Simone Rocha and Bhane, which is owned by her husband Anand Ahuja. Sonam completed her classy look with some lip colour and small gold hoops as earrings. Oh, she also buckled a black leather belt around her waist. Sonam's red carpet debut for this year was on Monday when she sashayed down the aisle in an embellished lehenga, hand-picked from the studious of Ralph and Russo. Sonam accessorised with diamond studs by Chopard and that was it! Sonam's outfit may have been from the pages of Indian tradition but had global appeal to it, courtesy the cape-like sleeves. 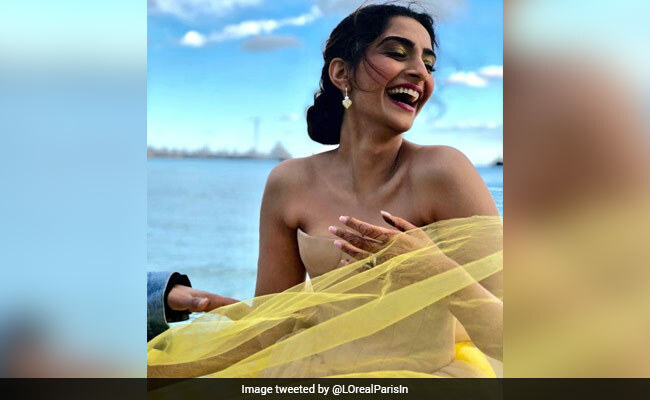 Sonam Kapoor's visit to the Cannes is her first international extravaganza after she married Delhi-based entrepreneur Anand Ahuja earlier this month. Sonam's wedding was followed by a big fat reception on the same day - May 8 - after which the couple made a stop-over in Delhi. Sonam headed out to Cannes from there and upon her return, she will be busy with the promotional duties of her upcoming movie Veere Di Wedding.